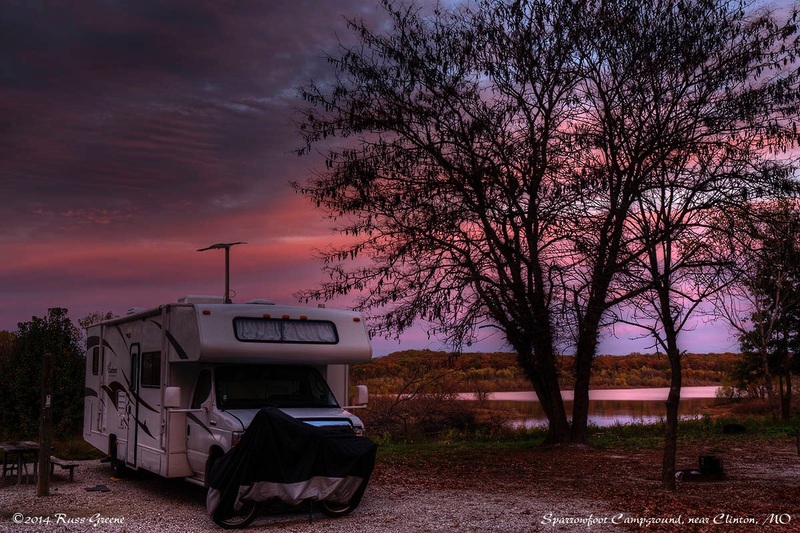 My covered motorcycle obscures the view of the front of my RV but who cares… Look at that sunset! 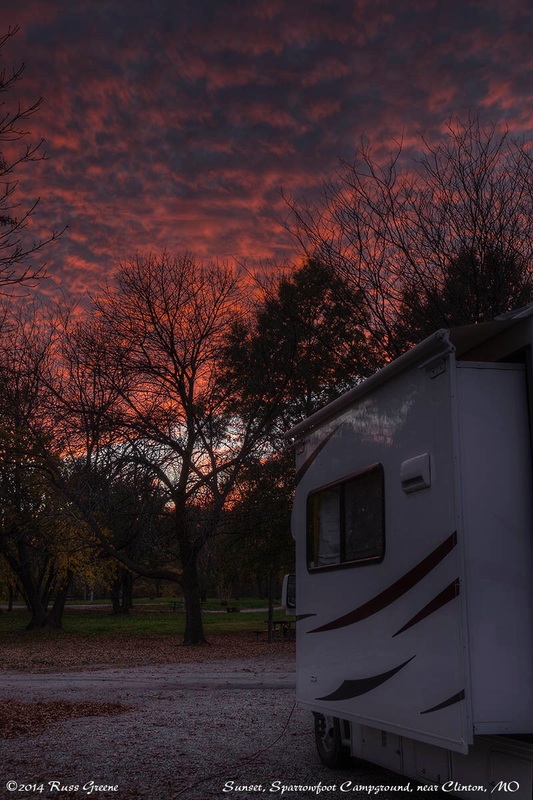 Sparrowfoot campground, Clinton, MO. Sparrowfoot’s campsites are in two loops, A and B. Each has a grassy field in the central area of the loop. MAXIMUM RIG SIZE: I don’t think there is published information. Sites looked big enough for a 30′ RV plus towed vehicle, perhaps a little larger or smaller depending on the site. Looking west at sunset at Sparrowfoot. Every now and then I’ve seen a sunset that looks nice in both easterly and westerly directions such as this one. The other sunset photo with this report was taken within a minute or so of this one. RESTROOMS: Vault toilets in Loop A; I believe there are flush toilets and showers over by Loop B during the main season. That building was locked when I was there in late October. TRASH: At the main entrance, some distance from the loops. I’d estimate it’s a half mile. This was during the off season. There may be additional hoppers during the main season at the loops but I don’t know. BUGS: None worth noting when I was there in late Oct.
Gas: Clinton has a number of stations but I saw a gas pump right next door to Sparrowfoot at Cozy Corner RV Park. I don’t know if it is operational. Dump: In the campground except no water at the dump station in the post season. For $10 you can use the dump at Cozy Corner RV park right next door. RV Park: Cozy Corner RV Park is right next door to Sparrowfoot. The have a lot of long term residents. The nightly rate with full hookups and 50 amp service was $30 in Oct. 2014 when this report was written. 660-885-8824. 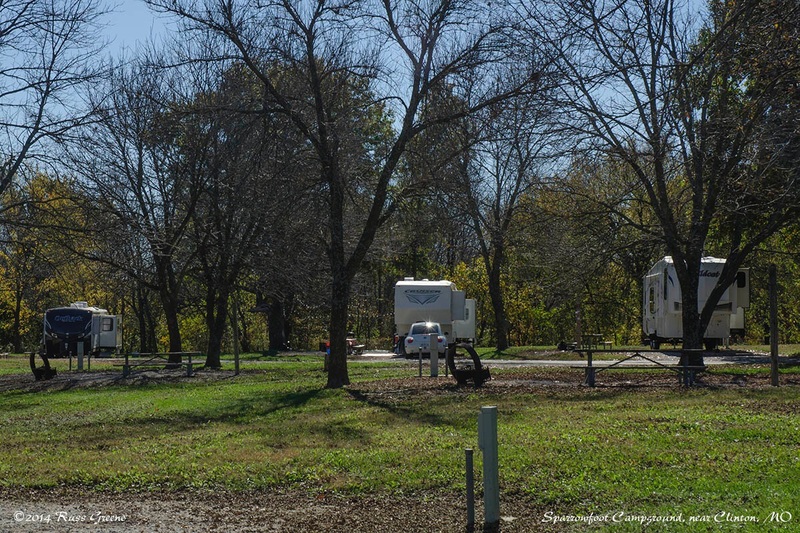 I stopped at Sparrowfoot campground on my way from Kansas City to Branson. At $4 a night for a campsite with electricity during the off season it represents a real value even considering there is no water then at the dump station, the showers and laundry are closed. Since I was heading for a full service campground in Branson after a short stay at Sparrowfoot I could use my own onboard facilities easily enough. A small play area for children is located at the B Loop. Charlene, my RV, is hiding amidst the trees in this photo taken at Sparrowfoot campground. Do you really think we can’t see you Charlene? You’re so silly sometimes! I didn’t explore the surrounding are but the campground hosts told me there is good catfish and crappie fishing in Harry S. Truman lake and in some places bass. The lake is man made and looks more like a neuron might appear under a microscope than a lake. There is a Visitor Center for the lake but I believe it’s about a 30 minute drive to get there… in Warrensburg if I’m not mistaken. The recreation.gov site says there is a boat ramp, and the RV park next door to Sparowfoot says they are 1/2 block from a public boat launch. Harry S. Truman lake is large with many branches and arms so it’s a pretty good bet there are a number of other boat launches. During my stay I saw birds of prey (I’m not sure what kind but I can tell a bird of prey when I see one), quite a few other kinds of birds including geese. I heard a great horned owl whoo-whooing nearby at night. I said back to it “It’s me” several times, but it kept asking “who-who?” anyway. Maybe I needed to mention my name. I saw what looked like a harmless garter snake in the road, especially harmless since it was roadkill. I felt sorry for the poor creature and said so to it. I also saw some white tailed deer. 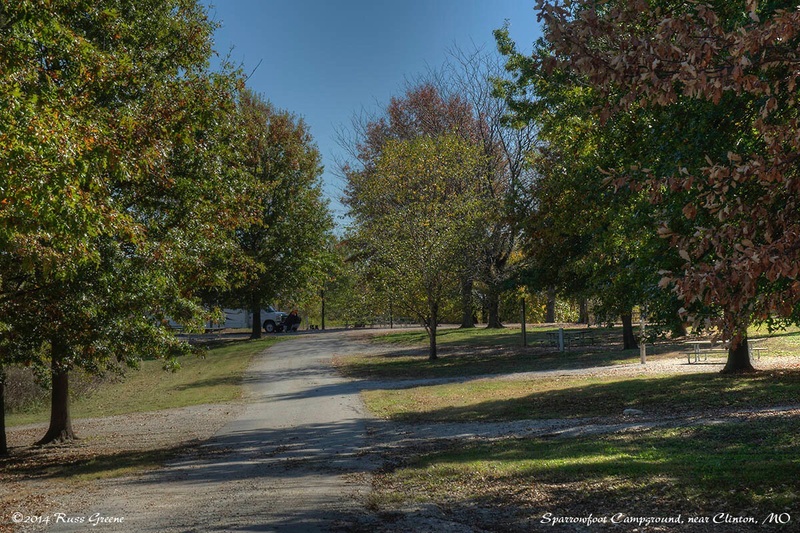 Cozy Corner, a private RV campground open year round is immediately adjacent to the entry drive to Sparrowfoot. They have propane there and a fully functioning dump station when, during the off season, the water is turned off at the dump station in Sparrowfoot. It was quiet as Sparrowfoot when I was there. For two days there were tent campers in the site next to me. For another three days there was nobody within a couple hundred feet. It was late October. The campground host told me, however, that November is the busiest month at Sparrowfoot because hunters roll in. In my estimation this is campground worth considering especially as a stopover if you’re passing through the area because of its proximity to Clinton, its affordability and because of the environment. Others may find activities such as the nearby boating, fishing and hunting of interest. According to AllStays there are 6 other COE campgrounds on the lake, most of them open all year. There are another 15 COE campgrounds divided between three other lakes not too far away. Down south, closer to the Arkansas/Missouri border there are a lot more COE campgrounds. Excellent, thorough review of the campground. Thanks for the pics… and whimsy!